The results of the Newcastle v Chelsea player ratings by fans. Always interesting to see what supporters have collectively made of the latest performance, when using our interactive ratings system. Each player marked out of 10 and the averages below. Four of the starting eleven received a rating of 6.4 or higher, no surprise that they were all players at the back. Martin Dubravka (6.7) top scored deservedly, could do nothing about either goal. Then on 6.4 we had three defenders: Yedlin, Schar and Fernandez all sharing that rating. The other seven players all rated between 5.1 and 5.9, none of them having really poor games but on a day when defence was the overwhelming priority, nobody else really stood out. Jacob Murphy (5.1) and Ki Sung-yueng (5.2) rated the lowest by fans. A special mention for Joselu, the sub (6.6) actually getting the highest outfield mark, coming off the bench and scoring that cracking goal. 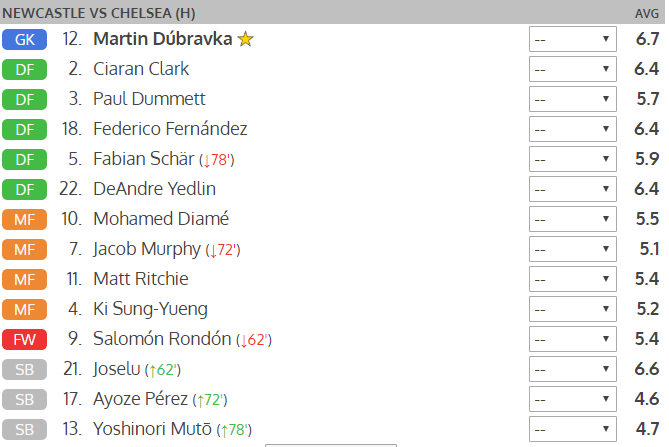 If you haven’t already put in your Newcastle v Chelsea player ratings, go HERE and you can still input your own marks out of 10 for each player, then check back later to see whether the overall interactive ratings have changed for the team as more fans vote. Newcastle v Crystal Palace player ratings from fans – Brutal or fair?